Choose a will for a single or married person or estate planning for a single or married person. Register, fill out forms, & purchase. An attorney drafts your petition & documents. Documents completed and ready for signature. 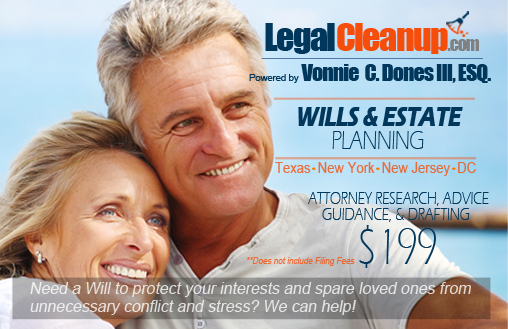 Texas, New York, New Jersey, & Washington, D.C. Wills & Estate Planning Lawyer Offering Traditional & Online Legal Services. Starting at $199! Need a Will to protect your interests and spare loved ones from unnecessary conflict and stress? Our law firm can help you ensure that your money and estate is inherited by the people you want to benefit and doesn’t go to people who you don’t want to benefit. We can help! You need a Will to ensure that you have provided instructions regarding the distribution of your assets. Creating a will, living trust, power of attorney, or living will, gives you control over what you worked so hard to acquire throughout your life. Don’t relinquish your rights to the court, exercise your power to choose who distributes and receives your wealth and looks after your children. Atlantic , Bergen , Burlington, Camden, Cape May, Cumberland, Essex, Gloucester, Hudson, Bergen, Essex, Middlesex, Monmouth, Hudson, Ocean, Union, Camden, Passaic, Morris, Burlington, Mercer, Somerset , Gloucester, Atlantic, Sussex, Cumberland, Hunterdon, Warren, Cape May, and Salem. Kings, Queens, New York, Suffolk, Bronx, Nassau, Westchester, Erie, Monroe, Richmond, Onondaga Orange, Dutchess, Albany, Rockland, Oneida, Saratoga, Niagara, Broome, Ulster, Rensselaer, Schenectady, Chautauqua, Oswego, Jefferson, Saint Lawrence, Ontario, Putnam, Tompkins, Steuben, Wayne, Chemung, Clinton, Cattaraugus, Cayuga, Sullivan, Madison, Warren, Livingston, Columbia, Otsego, Herkimer, Washington, Genesee, Fulton, Chenango, Tioga, Franklin, Greene, Allegany Montgomery, Cortland, Delaware, Orleans, Wyoming, Essex, Seneca, Schoharie, Lewis, Yates, Schuyler, and Hamilton. If we are unable to deliver what we promise. Will for an Single Person (Drafting/Legal Advice – $199.00). Will for a Married Person (Drafting/Legal Advice – $299.00). Estate Plan for a Single Person (Drafting/Legal Advice – $299.00). Estate Plan for a Married Person (Drafting/Legal Advice – $349.00). Having a Will ensures that you control who inherits your property and manages your affairs after death. What if a beneficiary dies before he or she receives their inheritance, do you have an alternative beneficiary? What if you own a piece of land and would like for it to be used only for the construction of a chapel, synagogue, or mosque? There are many circumstances that warrant you hiring an attorney to help you create the best Will or Estate Plan for you. By taking the time to speak with us, we can help you avoid any disagreement and confusion between your loved ones after your gone.